Index SOLD Price: $NZ 70 (estimate) Available on Order - expect 2 weeks for making and delivery. 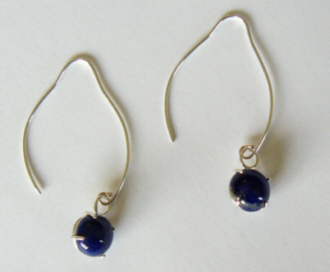 The loops are hand-forged on the premises from Sterling Silver, and the 10mm natural Lapis Lazuli cabochons have been hand-set in Sterling Silver wire. 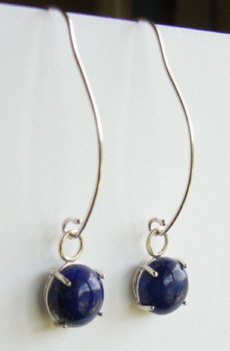 Beads made from Lapis Lazuli date as early as 2000-1800 BCE in the Egyptian Middle Kingdom period. Lapis Lazuli was the colour of the Divine and was reputed to promote clear understanding and intuition; it helps balance the function of the thyroid gland while strengthening the neck and vocal cords. (See www.shimmerlings.com/gemstones/). Natural Lapis Lazuli often has pyrite and calcite inclusions.